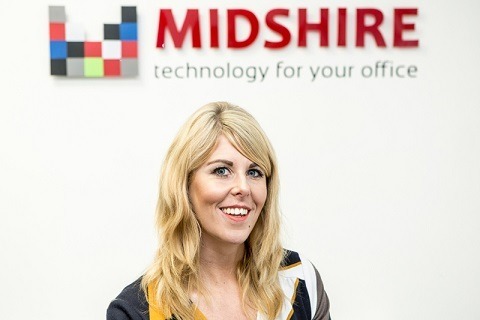 Tech dealer Midshire has announced that its group marketing manager, Adrienne Topping has been nominated for Business Woman of the Year at the TMT Awards 2017. The Technology, Media, and Telecoms Awards celebrate the best females within these highly competitive, fast paced and predominantly male industries. Nominees will be shortlisted by a panel of experts from a myriad of fields, including business, journalism and history, all of whom are well-versed in the research and vetting process. The panel will utilise supporting evidence, the votes received, and their own independent investigations into both the nominee and their firm to decide the worthy winners. Solely responsible for a group-wide rebrand in 2014 that completely transformed the company’s online and offline image, Adrienne has been a key player in building Midshire’s authority and reputation in the industry. Since joining, Adrienne has been pivotal in Midshire’s growth, doubling sales leads through various marketing activities, and developing a marketing department of 5 in-house designers, copywriters and marketeers entirely from scratch. The resultant growth has increased the company’s turnover by 80% and web traffic by 500% over 5 years, leading to the opening of 2 additional offices in Sheffield and Wales. Adrienne says: “It’s a real honour to be nominated at the TMT Awards this year, especially when the vetting process is so rigorous. “It’s really important to stay relevant at a time when technology is ever changing and all encompassing. People no longer want – or have to – wait for anything, so remaining ahead of the curve is paramount. Previously nominated at the Stockport Business Awards 2015 and Insider’s North West Young Professionals Awards 2016, Adrienne was highly commended as Marketing Professional of the Year at the Made in Manchester Awards 2016. This nomination will be Adrienne’s fourth recognition since joining Midshire in 2012, with winners to be announced later this year.